Edvard Munch, Norway’s greatest artist and famous for The Scream, once hooted and jeered by the public? How could that be? 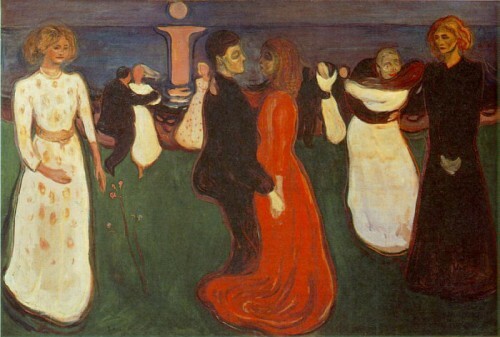 Munch’s paintings were revolutionary. The technique of scratching, layering and smudging the canvas was unheard of. His subjects were the complex ones of life, death, anxiety and human sexuality…frightening in their intensity and beauty, they have become icons causing Munch to be a precursor of modern psychology. We sense the spirit of Sigmund Freud hovering just beyond the frame! Only when he was 45 and famous abroad did Norway recognize Munch with the Royal Order of St. Olav. 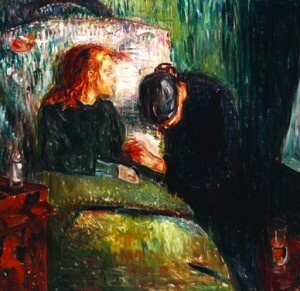 Munch, who never married, lived alone on his estate and became increasingly isolated, yet revered by his public. He called his paintings his children and hated to be separated from them. Self-Portrait. Between the Clock and the Bed was his last masterpiece, painted shortly before he died at the at the age of 80. 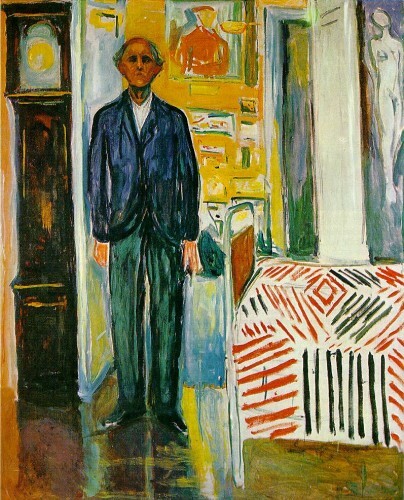 This final self-portrait showed the elderly artist standing between a grandfather clock and a bed, two harbingers at the end, his suit loose on his shrinking frame, his features barely there. The canvas is crammed with details – the paintings “his children” in the room behind him and the patterned bedspread on the single bed. See Munch’s most famous paintings. Click here if unable to view the video. He seemed tortured in many of his paintings but interested in life in others. I did not know he had such a large body of interesting work. Judging from the variety and vitality of Edward Munch’s “children”, it doesn’t appear that he missed much of “the dance of life.” Thank you for the thoughtful blog, Kirby; the video music was particularly apt. 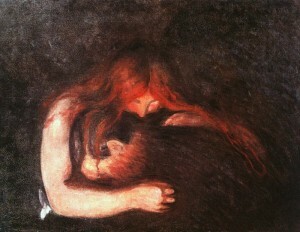 Beautiful, eye-opening video on Munch! The largo movement was the perfect accompaniment to what appeared to be images loaded with sexual longing and angst. It’s too bad he’s so famous just for the scream image; there are many images in this video alone that are much more arresting and original than it is, in my opinion. One of your best blogs so far. He must have loved & lost a lot. Proves the theory that humans need sunshine to stave off the depression. But what a painter & a sensitive man! I suppose we wouldn’t have the paintings he made if he had sunshine to cheer him up. . . .
Hi Kirby! Thank you for the great blogs… The one on Edvard Munch was particularly apropos as I will be working in Norway this summer, with that, I had decided to visit the Munch museum in Oslo. Now, with your blog & video, it will be for sure, probably “Scream” with delight! Thanks, Kirby!